One of the things I am grateful to N@W for is that it has become a forum for me to meet friends and experts from different fields. One of them is my breast-friend, Velvet Escario-Roxas who is an active breastfeeding advocate and well-versed in infant and young child feeding and nutrition. Since a popular question at the forum is what to feed children and encourage them to eat healthy foods, Velvet decided to hold a seminar to share her knowledge and expertise on healthy eating. Several N@wies banded together to organize the event. We had sign-up sheets, name tags, etc. The seminar ran for about 3 hours on a Sunday afternoon. I was happy to learn that we had been going the correct route with E - who is into baby led feeding (will post more about this later). Velvet showed us how to appreciate culture-based food and encouraged us to choose local produce like latundan banana (instead of lacatan or cavendish), sweet potatoes or camote instead of potatoe, kalamansi instead of oranges, etc. etc. Velvet also shared that it is better to give foods with thick consistency such as chunky soups e.g. monggo rather than foods with thin consistency like am or rice gruel. Foods with thin consistency do not give enough nutrients as they are usually watered down versions of nutritious meals. It is also important to note that as baby becomes more active, it is better to feed him/her small, frequent meals over spaced out huge meals. We grew up in a culture where we are taught to finish everything in our plate - which teaches us to grow up as obese adults. 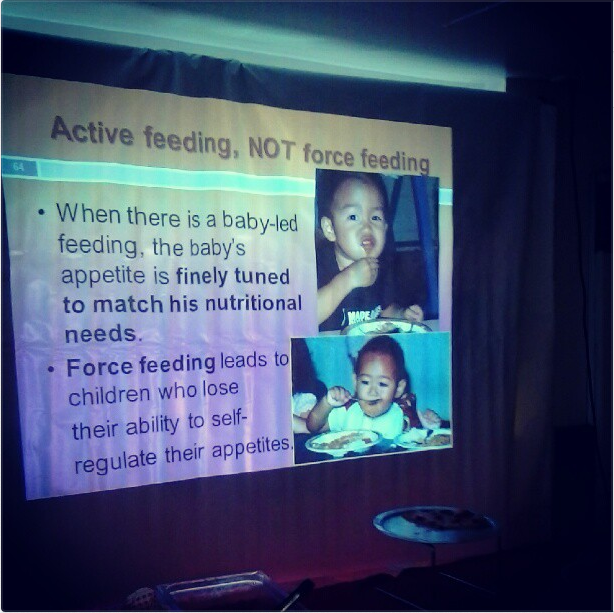 Velvet emphasizes that babies should be actively fed and not force fed. Velvet also shared that how food is introduced to a child is crucial for survival and lifelong health. Apparently, taste preferences are formed in early life and the content The mantra should be we live to eat and not eat to live. There should be pride and joy in food preparation and meal sharing. Babies should be taught to enjoy eating - highlight the importance of pleasure in eating, focusing not just on the taste but also the company and affection involved. 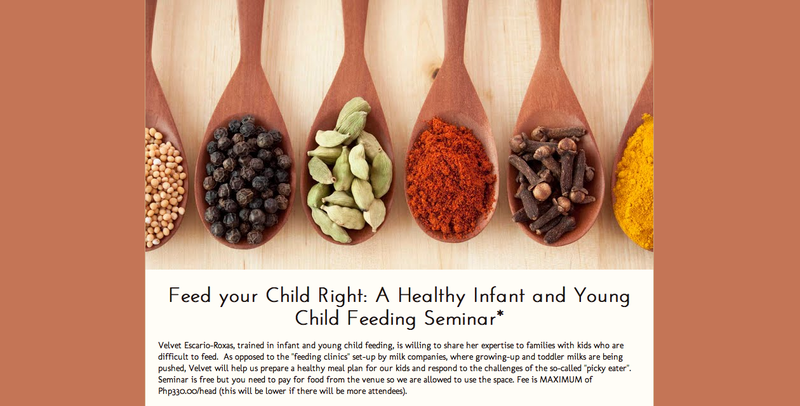 Do you have challenges in feeding your kids? How did you resolve them?